The most famous martial artist of all time, Bruce Lee, often a regular subject of film-makers, has been quiet as a topic of late, but no more. For FremantleMedia Enterprises are releasing the Network Entertainment produced documentary I Am Bruce Lee in cinemas this 20th July, and then on DVD and Blu-ray on the 23rd July. Directed by award-winning documentary film-maker Pete McCormack this features interviews with wife of the star Linda Lee Cadwell, his daughter Shannon Lee, JKD instructor and close friend Dan Inosanto, world champion kickboxer Bob Wall, a former JKD student Richard Bustillo, Mickey Rourke and Ed O'Neill, NBA All Star Kobe Bryant, Taboo from Black Eyed Peas, actress and MMA fighter Gina Carano, legendary stuntman and former wrestling and judo world champion Gene LeBell and UFC World Champion Jon Jones. With a runtime of 94 minutes, and a recommended retail price of £17.99 for the SD and £22.99 for the HD versions, extras will include personal films from Bruce Lee's archives, an Inspiration: Bruce Lee's Global Impact featurette, Bruce Lee in Action featurette and trailer. Despite his tragic and sudden death on 20th July 1973 at the age of 32, Bruce Lee's enormous influence on martial arts, entertainment and popular culture lives on to this day. 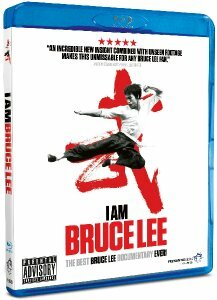 Utilizing rare archive footage, photos, movie clips and brand new interviews with members of his close family, as well as with numerous stars from the worlds of sport, music and acting who have been inspired by Lee's legacy, I Am Bruce Lee goes more deeply into the true story behind the legend than any ever before. The film also examines Bruce's connections to the establishment of Mixed Martial Arts as we know them today, acknowledging that if Gene LeBell is considered the Godfather of MMA then Bruce is without doubt the modern-day Father of MMA.